It matters not your age, social status or wealth, when the weather turns cooler and the night air crisp, excitement and anticipation fill your inner being when you know it's time again for the State Fair of Louisiana. People watching. And people have been coming to the State Fair to have a good time for 112 years. "Kick Up Your Heels" is the theme for this year's event, scheduled for Oct. 25 through Nov. 11 (with the exception of Mondays and Tuesdays). The lights and sounds of the midway and the carnival rides are definitely a big draw, but many don't realize the many facets of the fair that include events free to the public after the initial the cost of general admission. Carnival armbands may be purchased all 15 days of the fair with gate admission. "People want and expect certain traditional aspects, and I know our carnival will have at least four or five new rides that haven't been at the carnival before," Giordano said. "The State Fair of Louisiana does host the largest carnival midway in the state of Louisiana." Some free attractions with admission will be the same such as State Fair Zoo with Hollywood Racing Pigs, the Friesian Horse Show and the Double Hump Camel Show. "Circus Hollywood is a circus that performs in a big top during the fair," he said. "They change the acts each year." Giordano said he is very excited about one new act that is very popular around the fair circuit – Sea Lion Splash Show. 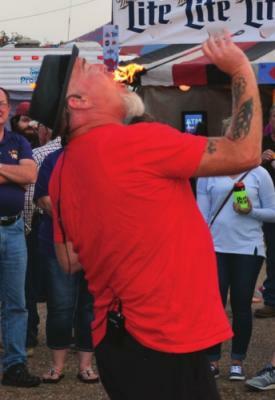 As fair-goers stroll the midway, they may encounter Dallas The Fire Guy, who eats and breathes fire while juggling, along with his son, Nick, who is an escape artist. "We have Rock-It Robot, who will be wandering the grounds, the Clown of Many Faces, and then a new street performer this year named Wacky Chad. He does tricks on a pogo stick and a unicycle … he's a juggler, as well," Giordano said. For gaming aficionados, Giordano said he is helping the Louisiana State Exhibit Museum bring in a new exhibit called "Pinball: An American Game Experience." "It will be in one of the wings of the museum, but it will feature pinball machines from the 1930s to the 1990s," he said. "Guests will be able to play the pinball machines for free and learn a lot of history on pinball – I didn't realize for a long time pinball was illegal in Los Angeles, New York, Chicago." In addition to the largest midway, the State Fair hosts the largest livestock show in the state. The fair also hosts open livestock shows. "Those are kids and adults that are showing animals – breeding animals – everything from Angus to Brahma to Herefords, cattle, goats, sheep and such," he said. "Those exhibitors come from all over the country." Giordano’s hope is that people will understand that while they have to spend money to park, gain admission, enjoy the carnival rides and eat, there is so much to do that is free. 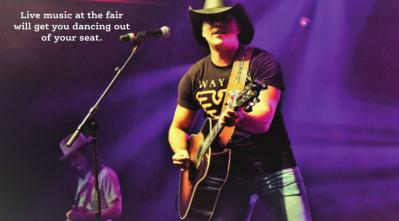 All concerts are free with fair admission, as well. Some performers include SiDE fx, Jeter Jones & The Perfect Blend Band, Cupid & Dance Party Express Band, Cypress Spring, Frank Foster, KANDU, BOYZ, Ying Yang Twins and many others that are listed on the fair’s website. The LRCA Rodeo, however, is a ticketed event. "Last year's Saturday night rodeo sold out," Giordano said. "We had a very good crowd on Friday, and this year we are introducing a new promotion for Thursday and calling it ‘Heroes Night,' giving any first responder that requests it two tickets, including law enforcement, fire, EMS and military." 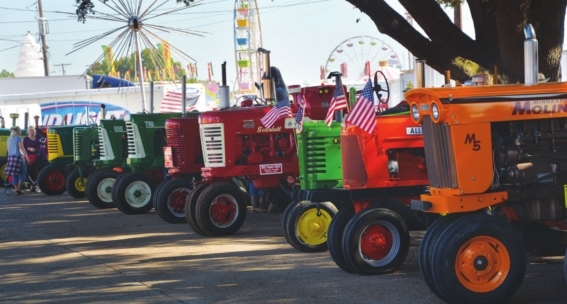 Coincidentally, Navy Week in Shreveport corresponds with the fair this year, which works to the event’s advantage. "The Navy Pride Band is performing at the fair Sunday, Oct. 28," Giordano said. "That will be their grand opening of Navy Week at the fair." Veterans and Military Appreciation Day is the last day and the best day of the fair, as far as Giordano is concerned. "On this day, we allow all military and their families to come to the fair free – free parking, free gate admission – and it's open to current, active military, retired, former, if you've ever been affiliated with the military," he said. "At 2 p.m., we have a veterans parade down the middle of the midway. There will be all types of military organizations, high school bands, groups and such that participate with the parade." Giordano said a formal impact study of the fair has not been conducted since 2003. At that time, the LSU Center for Business Research concluded the State Fair of Louisiana had a $24 million impact on the area. With a budget of $2.5 million, about a quarter of a million dollars is spent on security to ensure all attendees are safe. 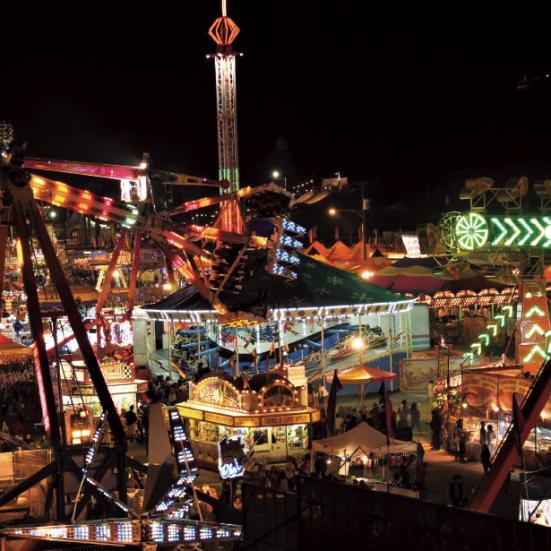 And while the lights, sounds and smells at night bring people to the fair, Giordano recommends people bring their small children earlier in the day, if they are concerned about safety. "Come in the afternoon and enjoy it, then let the sun go down, stay a little while and leave around 8:30 or nine o'clock," he said. An Advanced Discount Ticket Sale Campaign is underway. Gate admission tickets are $8 in advance and $12 at the gate. Once the fair opens, fair-goers will be able to take advantage of other discounts that save money, such as discount days and armbands. By providing these discounts, the State Fair of Louisiana hopes that every family will have the opportunity to attend this year's fair and create lifetime family memories in a safe and friendly environment. Enjoy all the fun of Crabtree Amusements Inc. Carnival Midway! The largest carnival midway in the state of Louisiana featuring over 60 exciting rides, games and food. There is also a separate Kiddie Land. Smoking and alcohol are not permitted inside Kiddie Land. You must be at least 36 inches tall to ride many of Crabtree Amusement's rides including kiddie rides. There are approximately eight rides that have a height requirement of 30 inches tall. Some of the larger rides have taller height requirements. Carnival rides accept magic money credits and armbands. Please follow rules that are posted on carnival rides. The rules are in place for your own safety. Carnival games accept tokens. Food booths accept cash. For your convenience, token dispensers are placed throughout the carnival midway. Each year the State Fair of Louisiana brings in many fair food concessions from all over the U.S. and local concessionaires as well. There is a midway full of both traditional fair foods and new fair foods. Some of the traditional fair foods include: cotton candy, corn dogs, funnel cakes, turkey legs, candy apples, caramel apples, pizza, cinnamon rolls, gyros, BBQ, salt water taffy, chicken-on-stick, shrimp-onstick, hamburgers, ice cream, Mexican food, etc. Other fair foods include: Wisconsin cheese, gator-on-stick, bacon-covered caramel apples, cricket pizza, scorpion pizza, maple bacon funnel cakes, red velvet funnel cakes, fried watermelon, Rocky Mountain oysters, Texas fried ribs, Kool-Aid pickles, donut burgers, fried cookie dough on stick, cookie dough parfait, fried cheesecake, etc. 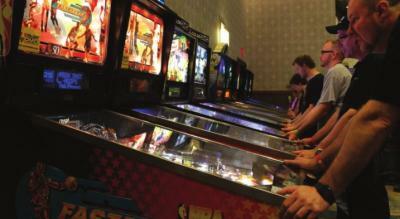 Special exhibit this year: "Pinball: An American Game Experience." The Louisiana State Exhibit Museum is bringing in this very cool, interactive pinball exhibit featuring pinball machines from the 1930s to the 1990s. Admission is free and gameplay is free. Discount Wednesdays: Gate Admission - $5 after 3 p.m.
Thursdays: Parking $2 after 3 p.m.
Gate Admission: $2 after 3 p.m.
Special Election Day Promotion: Tues., Nov. 6. Free parking and gate admission from 10 a.m. to 3 p.m. Gate admission $5 after 3 p.m.
*Street entertainers are free with your gate admission to the State Fair and perform several shows per day each day. When: Thurs., Nov. 1 / Fri., Nov. 2 / Sat., Nov. 3 at 7 p.m. Doors open at 6 p.m. When: Fri., Oct. 26, from 6 to 10 p.m. Sat., Oct. 27, from 10 a.m. to 6 p.m. When: Sat., Oct. 27, at 11 a.m. When: Sat., Oct. 27, at 2 p.m.
Free with your gate admission to State Fair. Oct. 25: SiDE fx: 6:30 p.m., 7:30 p.m. & 8:30 p.m.
Oct. 26: Jeter Jones & The Perfect Blend Band: 7 p.m.
Cupid & The Dance Party Express Band: 8:30 p.m.
Oct. 27: Frank Foster: 8:30 p.m.
Oct. 28: Navy Pride Band: 5 – 9 p.m.
Oct. 31: KANDU: 7 p.m., 8 p.m. & 9 p.m.
Nov. 1: Casey Martin Band: 7 p.m., 8 p.m. & 9 p.m.
Nov. 2: Ole Whiskey Revival: 7 p.m.
Cody Cooke & The Bayou Outlaws: 9 p.m.
Nov. 3: KYPER: 7 p.m.
Ying Yang Twins: 9:30 p.m.
Nov. 4: Fiesta at the Fair: 2 – 10 p.m.
La Energia Nortena: 8:30 p.m.
Nov. 6: The Rockin’ Redeyes: 6:30 p.m., 7:30 p.m. & 8:30 p.m.
Nov. 7: Shayliff: 7 p.m., 8 p.m. & 9 p.m.
Nov. 8: Gospel Mega Fest: 4 – 9:30 p.m.
Nov. 9: Total Choice: 7:30 p.m.
Nov. 10: A Tribute To Music Royalty: 7 p.m.
Nov. 11: Bayou Boogie: 3 p.m.
T-Broussard & The Zydeco Steppers: 5:30 p.m.